Hi ya iCopic Lovers, Melissa here to share a little card I put together. I'm so excited to be joining this talented group of ladies and want to share my excitement with you! The holidays are over and often times I find myself wishing for spring right away. However, that's just not going to happen, and it's still COLD out there! 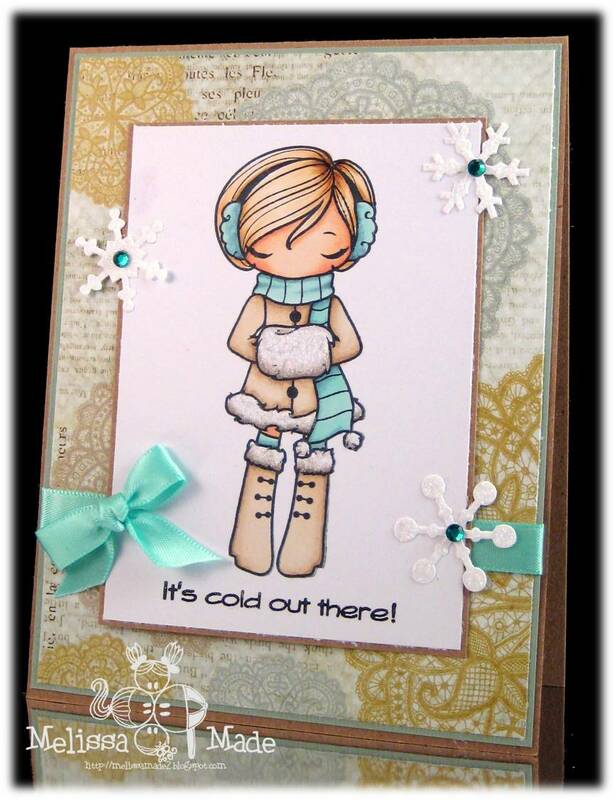 I decided to create this cute card using a winter stamp by The Greeting Farm from iCopic called Rain, Snow, Shine. We all need adorable holiday stamps for our holiday cards but often times feel limited with them, but don't! You can still create gorgeous cards with a wintery feel that are perfect before, during, and after the holidays. This is a perfect example. I stamped her on X-press It blending card paper with Tsukineko Tuxedo Black ink. Next, I colored her with Copics in the following colors: E50, E51, E53, E55, BG10, BG72, BG75, E000, E11, E00, R20, W1, W3, W5. The paper is from Pink Paislee. Don't forget to stop by iCopic and get your fabulous winter stamps today! Wonderful coloring! Ypur background fits perfect with the wonter tjeme to create an adorable card! Thank you for sharing! I love how you coloured her blonde hair.